The Spanish chemicals sector consists of more than 3,000 companies and generates more than 12% of industrial GDP. During the years of negative economic growth the industry has provedto be relatively resilient, mainly due to its export orientation. The Spanish chemicals sector obtains 57% of revenues from export markets, amounting to EUR 32 billion turnover and 14.7% of the total Spanish industry exports. Since 2000, the sector has increased its exports by more than 170%, demonstrating its competitive edge in the global market. 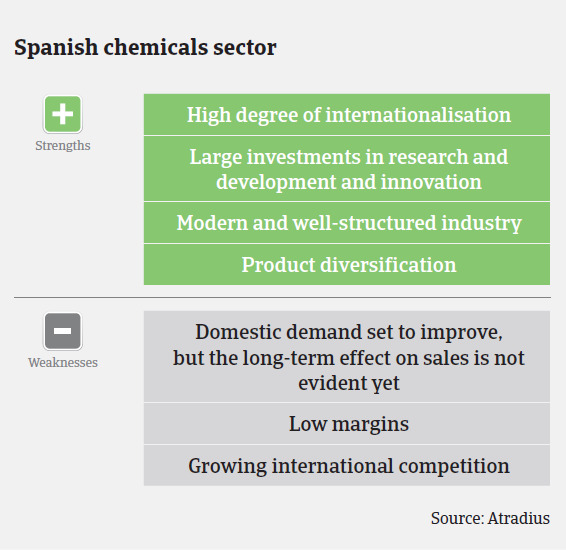 The Spanish chemicals sector mainly consists of small and medium- sized businesses, with 85% of the companies employing less than 50 people. However, the hydrocarbons subsector is represented by large groups such as Repsol and Cepsa. 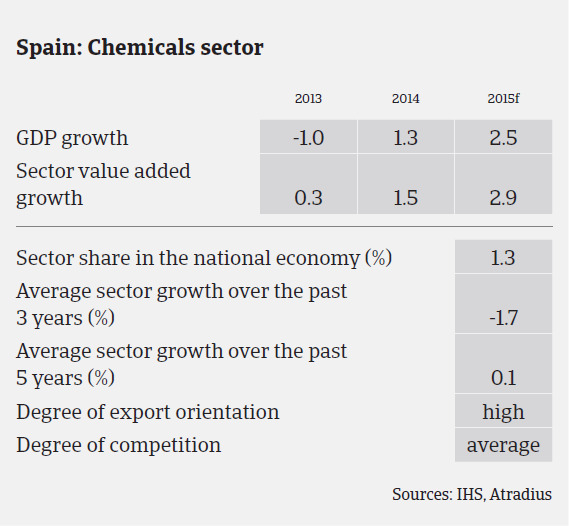 According to Feique (the business federation of the Spanish chemicals industry), in 2014 the Spanish chemicals sector recorded moderate turnover growth of 2%, rising to EUR 56,386 million. Exports increased 3.6% following 8.2% growth in 2013. The sector is forecast to grow further in 2015 due to the more positive domestic and international economic environment. Although exports will continue boosting overall sales, it is likely that internal demand will start playing an important role again, given the economic rebound in Spain. That said, many businesses are operating with very tight margins as a result of higher prices for raw materials and growing global competition. The pharmaceuticals subsector has experienced a gradual recovery since the second quarter of 2013. According to Farmaindustria (the Spanish pharmaceuticals trade association), accumulated public expenditure on pharmaceuticals decreased 30% from 2010 to Q1 of 2013. However, this trend started to slowly revert in Q2 of 2013, with year-on-year growth of 1% between January 2014 and January 2015. The demand side of prescriptions is also increasing moderately. Regarding the payment delays previously suffered by the sector, it is worth mentioning that the Spanish government has taken significant steps in order to mitigate the situation, as well as to rationalise medicine consumption. Payment behaviour in the chemicals industry depends on company size, sector activity and even the company’s location. On average, payments in the industry take around 60 days: better than most Spanish industries overall, where more than 50% of companies take more than 75 days to pay. We have seen no increase in notifications of non-payment and subsequent credit insurance claims in 2014 and in Q1 of 2015. The claims trend in the chemicals industry is better than the Spanish industry average and we expect insolvencies to remain low in 2015. Thanks to its high degree of internationalisation and the improvement of domestic demand, our underwriting approach to the chemicals sector is rather relaxed. However, we are still cautious about poorly rated buyers and those who cannot provide up-to-date financial information or trading experience. Even in the case of subsectors with a generally lower credit quality – for example pharmaceuticals and fuel – we have made every effort to optimize our exposure, seeking the most recent financial information, enabling us to maintain or even increase our credit approval. 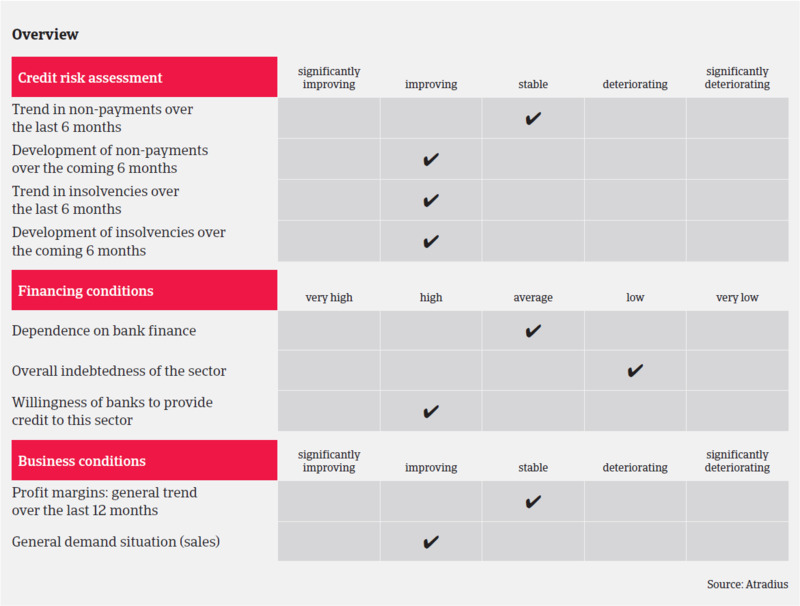 However, for small and medium-sized companies with high leverage and low margins we pursue a cautious underwriting approach, monitoring that liquid resources and cash generation are sufficient to meet businesses´ financial commitments.